Emerge-A Child’s Place welcomes therapy students to participate in our fieldwork program. As a teaching clinic, we use state of the art equipment, evidenced based practice, and highly trained clinical therapists to provide quality educational experiences for both level I and level II fieldwork students. Provide education and experience practicing pediatric occupational therapy using a sensory processing/integration approach. Practice treatment planning and implementation of intervention with children demonstrating a variety of diagnoses and age groups. Practice administering and scoring standardized pediatric therapy assessments. Practice communicating with families regarding their child’s progress in therapy through a structured parent education process. Promote inter-disciplinary practice among the therapy team at Emerge, as well as with, teachers, pediatricians, psychologists, and families. Provide the student with experiences that will prepare them for state licensure and national certification. Provide the student with experiences that will prepare them for a profession as a pediatric occupational therapist. Level II: Before beginning the Occupational Therapy Student Fieldwork program, students must have completed prerequisite coursework required by their university and ACOTE to be qualified for their level II Fieldwork Placements. It is also essential for the student to be familiar with developmental milestones across the pediatric lifespan, have an introduction to sensory processing/integration therapy, and a strong interest in working with children and their families. At Emerge – A Child’s Place, we are looking for level II students who demonstrate flexibility, a strong work ethic, and the ability to perform in a busy work environment. All Level I and II Fieldwork students are selected on a first come, first serve basis. It is also required that every level II student complete a brief interview with the Emerge Fieldwork Coordinator. This will be arranged during the fieldwork reservation process. All school coordinators submitting information for students for the Level II program should email the Occupational Therapy Fieldwork Coordinator at [email protected]. All students interested in participating in our Fieldwork Program should contact their school advisor to coordinate the affiliation agreement and reservation process. Hear what our previous students have to say about us! How would you describe the student experience at Emerge? Emerge has a focus on sensory regulation, which I think pairs amazingly well with the student experience. As you begin fieldwork, it is easy to feel overwhelmed with the new environment-- the gym is large and has 10-15 different swings, the closet has every game ever invented, and everything has a well thought out organization system. But as time goes on, you begin to feel more secure in your environment and you regulate. You take on more each week and learn to adapt to the changing workload. And by the end of 12 weeks, you look back and realize how something that used to scare you (*hanging the bolster swing*) feels easy and how much you have grown as a student practitioner. What was your biggest takeaway from your student experience at Emerge? How did you fieldwork educator play a role in your development as an OT? My fieldwork educator, Andrew, was essential in my development as an OT practitioner. He was receptive to my learning style which made me feel comfortable collaborating together on interventions and bringing him my thousands of questions. Andrew is a very skilled therapist and always had an idea or in-the-moment trick up his sleeve that only furthered my clinical reasoning. In addition to weekly meetings, Andrew would give me feedback after sessions on what went well and what I could work on. Additionally, he knew when to push forward, at times that I needed his input and when to step back, at times that he felt I was ready to be more independent. 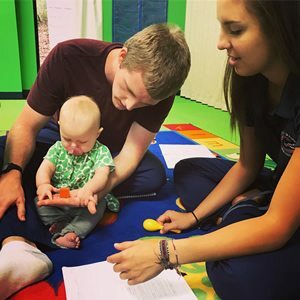 I would describe the student experience at Emerge as intentional, involved, and thoughtful--students are not just exposed to meetings, therapy, and consults, but included in them in a way that encourages them to become leaders in the pediatric therapy world. I spent more time planning therapy and executing the projects in place at Emerge than any of my other placements, but this time paid off in making me a more confident clinician that could articulate the purpose behind the activities and treatment options I'd chosen for my patients. I loved being an OT student at Emerge. One of my favorite parts was being around so many fantastic therapists who all contributed to my learning in some way, whether it be through treatment ideas, answering random questions, or presenting on a topic over lunch. Emerge is extremely supportive of their students, and I always felt I could ask any of the therapists for advice. Being a student at Emerge definitely put me outside of my comfort zone in a positive way, as it helped me grow and learn so much in just a few months. My fieldwork educator was excellent - she was a fantastic role model, provided great feedback throughout my time there, and was always willing to spend extra time discussing various things with me. Overall, my experience at Emerge was a great one and I would highly recommend it for a fieldwork placement! How did you fieldwork educator play a role in your development as a speech therapist? My fieldwork educator, Anna, played a role in my development as a speech language pathologist by giving me an attainable role model to look up to. I appreciated how she thought critically about how to play to each child's strengths and devoted time in speech therapy to addressing sensory and motor needs based on the advice of the child's occupational therapist. On a daily basis, I still try to emulate that when I am evaluating what is working and not working with my own patients. She gave feedback to make me a better clinician, not just as required on certain dates, and not just to shape me into being a carbon copy of herself--her focus was to empower me to utilize my own strengths to be the best clinician I could be.